Climate is governed by the general circulation of the atmosphere  the global pattern of air movements, with its semi-tropical trade winds, its air masses rising in the tropics to descend farther north, its cyclonic storms that carry energy and moisture through middle latitudes, and so forth. Many meteorologists suspected that shifts in this pattern were a main cause of climate change. They could only guess about such shifts, for the general circulation was poorly mapped before the 1940s (even the jet streams remained to be discovered). The Second World War and its aftermath brought a phenomenal increase in observations from ground level up to the stratosphere, which finally revealed all the main features. Yet up to the 1960s, the general circulation was still only crudely known, and this knowledge was strictly observational. From the 19th century forward, many scientists had attempted to explain the general pattern by applying the laws of the physics of gases to a heated, rotating planet. All their ingenious efforts failed to derive a realistic mathematical solution. The best mathematical physicists could only offer simple arguments for the character of the circulation, arguments which might seem plausible but in fact were mere hand-waving. (3) And with the general global circulation not explained, attempts to explain climate change in terms of shifts of the pattern were less science than story-telling. The solution would come by taking the problem from the other end. Instead of starting with grand equations for the planet as a whole, one might seek to find how the circulation pattern was built up from the local weather at thousands of points. But the physics of local weather was also a formidable problem. In 1922, the British mathematician and physicist Lewis Fry Richardson published a more complete numerical system for weather prediction. His idea was to divide up a territory into a grid of cells, each with its own set of numbers describing its air pressure, temperature, and the like, as measured at a given hour. He would then solve the equations that told how air behaved (using a method that mathematicians called finite difference solutions of differential equations). He could calculate wind speed and direction, for example, from the difference in pressure between two adjacent cells. These techniques were basically what computer modelers would eventually employ. Richardson used simplified versions of Bjerknes's "primitive equations," reducing the necessary arithmetic computations to a level where working out solutions by hand seemed feasible. Even so, "the scheme is complicated," he admitted, "because the atmosphere itself is complicated." The number of required computations was so great that Richardson scarcely hoped his idea could lead to practical weather forecasting. Even if someone assembled a "forecast-factory" employing tens of thousands of clerks with mechanical calculators, he doubted they would be able to compute weather faster than it actually happens. But if he could make a model of a typical weather pattern, it could show meteorologists how the weather worked. So Richardson attempted to compute how the weather over Western Europe had developed during a single eight-hour period, starting with the data for a day when scientists had coordinated balloon-launchings to measure the atmosphere simultaneously at various levels. The effort cost him six weeks of pencil-work Perhaps never has such a large and significant set of calculations been carried out under more arduous conditions: a convinced pacifist, Richardson had volunteered to serve as an ambulance-driver on the Western Front. He did his arithmetic as a relief from the surroundings of battle chaos and dreadful wounds. This was a subject of keen interest to everyone, but particularly to the military services, who well knew how battles could turn on the weather. Von Neumann, as a committed foe of Communism and a key member of the American national security establishment, was also concerned about the prospect of "climatological warfare." It seemed likely that the U.S. or the Soviet Union could learn to manipulate weather so as to harm their enemies. Under grants from the Weather Bureau, the Navy, and the Air Force, von Neumann assembled a small group of theoretical meteorologists at Princeton's Institute for Advanced Study. (Initially the group was at the Army's Aberdeen Proving Grounds, and later it also got support from the U.S. Atomic Energy Commission.) If regional weather prediction proved feasible, the group planned to move on to the extremely ambitious problem of modeling the entire global atmosphere. Von Neumann invited Jule Charney, an energetic and visionary meteorologist, to head the new Meteorology Group. Charney came from Carl-Gustaf Rossby's pioneering meteorology department at the University of Chicago, where the study of weather maps and fluids had developed a toolkit of sophisticated mathematical techniques and an intuitive grasp of basic weather processes. Richardson's equations were the necessary starting-point, but Charney had to simplify them if he hoped to run large-scale calculations in weeks rather than centuries. Solutions for the atmosphere equations were only too complete. They even included sound waves (random pressure oscillations, amplified through the computations, were a main reason Richardson's heoric attempt had failed). Charney explained that it would be necessary to "filter out" these unwanted solutions, as one might use an electronic filter to remove noise from a signal, but mathematically. The big challenge was still what it had been in the traditional style of physics theory: to combine and simplify equations until you got formulas that gave sensible results with a feasible amount of computation. To be sure, the new equipment could handle an unprecedented volume of computations. However, the most famous computers of the 1940s and 1950s were dead slow by comparison with a simple laptop computer of later years. Moreover, a team had to spend a good part of its time just fixing the frequent breakdowns. A clever system of computation could be as helpful as a computer that ran five times faster. Developing usable combinations and approximations of meteorological variables took countless hours of work, and a rare combination of mathematical ingenuity and physical insight. And that was only the beginning. These early forecasting models were regional, not global in scale. Calculations for numerical weather prediction were limited to what could be managed in a few hours by the rudimentary digital computers  banks of thousands of glowing vacuum tubes that frequently burned out, connected by spaghetti-tangles of wiring. Real-time weather forecasting was also limited by the fact that a computation had to start off with data that described the actual weather at a given hour at every point in a broad region. That was always far from perfect, for the instruments that measured weather were often far apart and none too reliable. Besides, the weather had already changed by the time you could bring the data together and convert it to a digital form that the computers could chew on. It was not for practical weather prediction that meteorologists wanted to push on to model the entire general circulation of the global atmosphere. The scientists could justify the expense by claiming that their work might eventually show how to alter a region’s climate for better or worse, as in von Neumann's project of climatological warfare. Perhaps some of them also hoped to learn what had caused the climate changes known from the past, back to the great Ice Ages. Some historians believed that past civilizations had collapsed because of climate changes, and it might be worth knowing about that for future centuries. But for the foreseeable future the scientists' interest was primarily theoretical: a hope of understanding at last how the climate system worked. That was a fundamentally different type of problem from forecasting. Weather prediction is what physicists and mathematicians call an "initial value" problem, where you start with the particular set of conditions found at one moment and compute how the system evolves, getting less and less accurate results as you push forward in time. Calculating the climate is a "boundary value" problem, where you define a set of unchanging conditions, the physics of air and sunlight and the geography of mountains and oceans, and compute the unchanging average of the weather that these conditions determine. To see how climate might change, modelers would eventually have to combine these two approaches, but that would have to wait until they could compute something resembling the present average climate. That computation became a holy grail for theoretical meteorologists. Norman Phillips in Princeton took up the challenge. He was encouraged by "dishpan" experiments carried out in Chicago, where patterns resembling weather had been modeled in a rotating pan of water that was heated at the edge. For Phillips this proved that "at least the gross features of the general circulation of the atmosphere can be predicted without having to specify the heating and cooling in great detail." If such an elementary laboratory system could model a hemisphere of the atmosphere, shouldn't a computer be able to do as well? To be sure, the computer at Phillips's disposal was as primitive as the dishpan (its RAM held all of five kilobytes of memory and its magnetic drum storage unit held ten). So his model had to be extremely simple. By mid-1955 Phillips had developed improved equations for a two-layer atmosphere. To avoid mathematical complexities, his grid covered not a hemisphere but a cylinder, 17 cells high and 16 in circumference. He drove circulation by putting heat into the lower half, somewhat like the dishpan experimenters only with numbers rather than an electrical coil. The calculations turned out a plausible jet stream and the evolution of a realistic-looking weather disturbance over as long as a month. Von Neumann immediately called a conference to publicize Phillips's triumph, drumming up government funding for a long-term project. The effort got underway that same year, 1955, under the direction of Joseph Smagorinsky at the U.S. Weather Bureau near Washington, DC. Smagorinsky's goal was the one first envisaged by von Neumann and Charney: a general circulation model of the entire three-dimensional global atmosphere built directly from the primitive equations. (16) In 1958, Smagorinsky invited Syukuro ("Suki") Manabe to join the lab. Manabe was one of a group of young men who had studied physics at Tokyo University in the difficult years following the end of the Second World War. These ambitious and independent-minded students had few opportunities for advancement in Japan, and several wound up as meteorologists in the United States. With Smagorinsky and others, Manabe built one of the world's most vigorous and long-lasting GCM development programs. Smagorinsky and Manabe put into their model how radiation passing through the atmosphere was impeded not only by water vapor but also by ozone and carbon dioxide gas (CO2), they put in how the air exchanged water and heat with simplified ocean, land, and ice surfaces, they put in the way rain fell on the surface and evaporated or ran off in rivers, and much more. Manabe spent many hours in the library studying such esoteric topics as how various types of soil absorbed water. The huge complexities of the modeling required contributions from several others. "This venture has demonstrated to me," Smagorinsky wrote, "the value if not the necessity of a diverse, imaginative, and dedicated working group in large research undertakings." As decades passed this necessity would drive the community of researchers to grow by orders of magnitude without ceasing to collaborate closely. From the early 1960s on, modeling work interacted crucially with fields of geophysics such as hydrology (soil moisture and runoff), glaciology (ice sheet formation and flow), meteorological physics (cloud formation and precipitation, exchanges between winds and waves, and so forth). Studies of local small-scale phenomena  often stimulated by the needs of modelers  provided basic parameters for GCM's. Those developments are not covered in these essays. In the late 1950s, as computer power grew and the need for simplifying assumptions diminished, other scientists around the world began to experiment with many-leveled models based on the primitive equations of Bjerknes and Richardson. An outstanding case was the work of Yale Mintz in the Department of Meteorology of the University of California, Los Angeles (UCLA). Already in the early 1950s Mintz had been trying to use the temperamental new computers to understand the circulation of air  "heroic efforts" (as a student recalled) "during which he orchestrated an army of student helpers and amateur programmers to feed a prodigious amount of data through paper tape to SWAC, the earliest computer on campus. "(18) Phillips’s pioneering 1956 paper convinced Mintz that numerical models would be central to progress in meteorology. He embarked on an ambitious program (far too ambitious for one junior professor, grumbled some of his colleagues). Unlike Smagorinsky's team, Mintz sometimes had to scramble to get access to enough computer time. (19) But like Smagorinsky, Mintz had the rare vision and drive necessary to commit himself to a research program that must take decades to reach its goals. And like Smagorinsky, Mintz recruited a young Tokyo University graduate, Akio Arakawa, to help design the mathematical schemes for a general circulation model. In the first of a number of significant contributions, Arakawa devised a novel and powerful way to represent the flow of air on a broad scale without requiring an impossibly large number of computations. A supplementary essay on Arakawa's Computation Device describes his scheme for computing fluid flow, a good example of how modelers developed important (but sometimes controversial) techniques. Modeling techniques and entire GCMs spread by a variety of means. In the early days, as Phillips recalled, modelers had been like "a secret code society." The machine-language computer programs were "an esoteric art which would be passed on in an apprentice system. "(22) Over the years, programming languages became more transparent and codes were increasingly well documented. Yet there were so many subtleties that a real grasp still required an apprenticeship on a working model. Commonly, a new modeling group began with some version of another group's model. A post-doctoral student (especially from the influential UCLA group) might take a job at another institution, bringing along his old team's computer code. The new team he assembled would start off working with the old code and then set to modifying it. Others built new models from scratch. Through the 1960s and 1970s, important GCM groups emerged at institutions from New York to Australia. Sophisticated computer models were gradually displacing the traditional hand-waving models where each scientist championed some particular single "cause" of climate change. Such models had failed to come anywhere near to explaining even the simplest features of the Earth's climate, let alone predicting how it might change. A new viewpoint was spreading along with digital computing. Climate was not regulated by any single cause, the modelers said, but was the outcome of a staggeringly intricate complex of interactions, which could only be comprehended in the working-through of the numbers themselves. GCMs were not the only way to approach this problem. Scientists were developing a rich variety of computer models, for there were many ways to slice up the total number of arithmetic operations that a computer could run through in whatever time you could afford to pay for. You could divide up the geography into numerous cells, each with numerous layers of atmosphere; you could divide up the time into many small steps, and work out the dynamics of air masses in a refined way; you could make complex calculations of the transfer of radiation through the air; you could construct detailed models for surface effects such as evaporation and snow cover... but you could not do all these at once. Different models intended for different purposes made different trade-offs. One example was the work of Julian Adem in Mexico City, who sought a practical way to predict climate anomalies a few months ahead. He built a model that had low geographical resolution but incorporated a large number of land and ocean processes. John Green in London pursued a wholly different line of attack, aimed at shorter-term weather prediction. His analysis concentrated on the actions of large eddies in the atmosphere and was confined to idealized mathematical equations. It proved useful to computer modelers who had to devise numerical approximations for the effects of the eddies. Other groups chose to model the atmosphere in one or two dimensions rather than all three. (30) The decisions such people made in choosing an approach involved more than computer time. They also had to allocate another commodity in short supply  the time they could spend thinking. This essay does not cover the entire range of models, but concentrates on those which contributed most directly to greenhouse effect studies. For models in one or two dimensions, see the article on Basic Radiation Calculations. The growing community of climate modelers was strengthened by the advance of computer systems that carried out detailed calculations on short timescales for weather prediction. This progress required much work on parameterization  schemes for representing cloud formation, interactions between waves and winds, and so forth. Such studies accelerated as the 1970s began. (33) The weather forecasting models also required data on conditions at every level of the atmosphere at thousands of points around the world. Such observations were now being provided by the balloons and sounding rockets of an international World Weather Watch, founded in the mid 1960s. The volume of data was so great that computers had to be pressed into service to compile the measurements. Computers were also needed to check the measurements for obvious errors (sometimes several percent of the thousands of observations needed to be adjusted). Finally, computers would massage the data with various smoothing and calibration operations to produce a unified set of numbers to feed into calculations. The instrumental systems were increasingly oriented toward producing numbers meaningful to the models, and vice-versa; global data and global models were no longer distinct entities, but parts of a single system for representing the world. (34) The weather predictions became accurate enough — looking as far as three days ahead — to be economically important. That built support for the meteorological measurement networks and computer studies necessary for climate work. An example of the crossover could be found at NASA's Goddard Institute for Space Studies in New York City. A group there under James (Jim) Hansen had been developing a weather model as a practical application of its mission to study the atmospheres of planets. For one basic component of this model, Hansen developed a set of equations for the transfer of radiation through the atmosphere, based on work he had originally done for studies of the planet Venus. The same equations could be used for a climate model, by combining them with the elegant method for computing fluid dynamics that Arakawa had developed. In the 1970s, Hansen assembled a team to work up schemes for cloud physics and the like to put into a model that would be both fast-running and realistic. An example of the kind of detail they pursued was a simple equation they devised to represent the reflection of sunlight from snow. They included the age of the snow layer (as it gradually melted away) and the "masking" by vegetation (snowy forests are darker than snowy tundra). To do the computations within a reasonable time, they had to use a grid with cells a thousand kilometers square, averaging over all the details of weather. Eventually they managed to get a quite realistic-looking climate. It ran an order of magnitude faster than some rival GCMs, permitting the group to experiment with multiple runs, varying one factor or another to see what changed. (35*) In such studies, the global climate was beginning to feel to researchers like a comprehensible physical system, akin to the systems of glassware and chemicals that experimental scientists manipulated on their laboratory benches. Meanwhile the community of modelers continued to devise more realistic parameters for various physical processes, and to sharpen their mathematical techniques. A major innovation that spread during the 1970s took a new approach to the basic architecture of models. Some groups, instead of dividing the planet's surface into a grid of thousands of square cells, took to dividing it into a tier of segments  hemispheres, quadrants, eighths, sixteenths, etc. ("spherical harmonics"). After doing a calculation on this abstracted system, they could combine and transform the numbers back into a geographical map. This "spectral transform" technique simplified many of the computations, but it was feasible only with the much faster new computers. For decades afterward, physicists who specialized in other fields of fluid dynamics were startled when they saw a climate model that did not divide up the atmosphere into millions of boxes, but used the refined abstraction of spherical harmonics. The method worked only because the Earth's atmosphere has an unusual property for a fluid system  it is in fact quite nearly spherical. Groups continued to proliferate, borrowing ideas from earlier models and devising new techniques of their own. Here as in most fields of science, Europeans had recovered from the war's devastation and were catching up with the Americans. In particular, during the mid-1970s a consortium of nations set up a European Centre for Medium-Range Weather Forecasts and began to contribute to climate modeling. A "family tree" of relations between leading models is here. This was the first time a greenhouse warming computation included enough of the essential factors to seem plausible to the experts. For instance, Wallace Broecker, who would later play a major role in climate change studies, recalled that it was the 1967 paper "that convinced me that this was a thing to worry about." A half-century later another scientist called it "arguably the greatest climate-science paper of all time," for it "essentially settled the debate on whether carbon dioxide causes global warming. "(44) The work drew on all the experience and insights accumulated in the labor to design GCMs, but it was no more than a first baby step toward a realistic three-dimensional model of the changing climate. The next important step was taken in the late 1960s by Manabe’s group, now at Princeton. Their GCM was still highly simplified. In place of actual land and ocean geography they pictured a geometrically neat planet, half damp surface (land) and half wet (a "swamp" ocean). Worse, they could not predict cloudiness but just held it unchanged at the present level when they calculated the warmer planet with doubled CO2. However, they did incorporate the movements of water, predicting changes in soil moisture and snow cover on land, and they calculated sea surface temperatures well enough to show the extent of sea ice. They computed nine atmospheric levels. The results, published in 1975, looked quite realistic overall (link from below). Manabe and Wetherald warned that "it is not advisable to take too seriously" the specific numbers they published. (46) They singled out the way the model treated the oceans as a simple wet surface. On our actual planet, the oceans absorb large quantities of heat from the atmosphere, move it around, and release it elsewhere. (47) Another and more subtle problem was that Manabe and Wetherald had not actually computed a climate change. Instead they had run their model twice to compute two equilibrium states, one with current conditions and one with doubled CO2. In the real world, the atmosphere would pass through a series of changes as the level of the gas rose, and there were hints that the model could end up in different states depending on just what route it took. Even if those uncertainties could be cleared up, there remained the old vexing problem of clouds. As the planet got warmer the amounts of cloudiness would probably change at each level of the atmosphere in each zone of latitude, but change how? There was no reliable way to figure that out. Worse, it was not enough to have a simple number for cloud cover. Scientists were beginning to realize that clouds could either tend to cool a region (by reflecting sunlight) or warm it (by trapping heat radiation from below, especially at night). The net effect depended on the types of cloud and how high they floated in the atmosphere. A better prediction of climate change would have to wait on general improvements. The problem was so vexing that the President's Science Adviser (who happened to be a geophysicist) asked the National Academy of Sciences to study the issue. The Academy appointed a panel, chaired by Jule Charney and including other respected experts who had been distant from the recent climate debates. They convened at Woods Hole in the summer of 1979. They had plenty of work to review, for by this time there were enough independent climate modeling groups to create a substantial literature. For example, a conference that convened in Washington, DC in 1978 to compare and evaluate models (the first of many "intercomparison" meetings) brought together 81 scientists from modeling groups in 10 countries. (52a) Charney's panel concentrated on comparing the two most complete GCMs, one constructed by Manabe's team and the other by Hansen's — elaborate three-dimensional models that used different physical approaches and different computational methods for many features. The panel found differences in detail but solid agreement for the main point: the world would get warmer as CO2 levels rose. To make their conclusion more concrete, the Charney panel decided to announce a specific range of numbers. They argued out among themselves a rough-and-ready compromise. Hansen's GCM predicted a 4°C rise for doubled CO2, and Manabe's latest figure was around 2°C. Splitting the difference, the panel thought it "most probable" that if CO2 reached this level the planet would warm up by about three degrees, plus or minus fifty percent: in other words, 1.5-4.5°C (2.7-8°F). This was a global average; the changes would be much greater in some regions and seasons, much less in others.They concluded dryly, "We have tried but have been unable to find any overlooked or underestimated physical effects" that could reduce the warming. In the early 1980s, several groups pressed ahead toward more realistic models. They put in a reasonable facsimile of the Earth's actual geography, and replaced the wet "swamp" surface with an ocean that could exchange heat with the atmosphere. Thanks to increased computer power the models were now able to handle seasonal changes as a matter of course. It was also reassuring when Hansen's group and others got a decent match to the rise-fall-rise curve of global temperatures since the late 19th century, once they put in not only the rise of CO2 but also changes in emissions of volcanic dust and solar activity. The skeptics were not persuaded. The Charney panel itself had pointed out that much more work was needed before models would be fully realistic. The treatment of clouds remained a central uncertainty. Another great unknown was the influence of the oceans. Back in 1979 the Charney panel had warned that the oceans' enormous capacity for soaking up heat could delay an atmospheric temperature rise for decades. Global warming might not become obvious until all the surface waters had warmed up, which would be too late to take timely precautions. (57) This time lag was not revealed by the existing GCMs, for these computed only equilibrium states. The models, lacking nearly all the necessary data and thwarted by formidable calculational problems, simply did not account for the true influence of the oceans. Massive international programs of data-gathering were beginning to solve one of the problems. Oceanographers were coming to realize that large amounts of energy were carried through the seas by a myriad of whorls of various types, from tiny convection swirls up to sluggish eddies a thousand kilometers wide. Calculating these whorls, like calculating all the world's individual clouds, was beyond the reach of the fastest computer. Again parameters had to be devised to summarize the main effects, only this time for entities that were far worse observed and understood than clouds. Modelers could only put in average numbers to represent the heat that they knew somehow moved vertically from layer to layer in the seas, and the energy somehow carried from warm latitudes toward the poles. They suspected that the actual behavior of the oceans might work out quite differently from their models. And even with the simplifications, to get anything halfway realistic required a vast number of computations, indeed more than for the atmosphere. Manabe was keenly aware that if the Earth's future climate were ever to be predicted, it was "essential to construct a realistic model of the joint ocean-atmosphere system. "(58) He shouldered the task in collaboration with Kirk Bryan, an oceanographer with meteorological training, who had been brought into the group back in 1961 to build a stand-alone numerical model of the circulation of an ocean. The two got together to construct a computational system that coupled together their separate models. Manabe's winds and rain would help drive Bryan's ocean currents, while in return Bryan's sea-surface temperatures and evaporation would help drive the circulation of Manabe's atmosphere. At first they tried to divide the work: Manabe would handle matters from the ocean surface upward, while Bryan would take care of what lay below. But they found things just didn't work that way for studying a coupled system. They moved into one another's territory, aided by a friendly personal relationship. Bryan and Manabe were the first to put together in one package approximate calculations for a wide variety of important features. They not only incorporated both oceans and atmosphere, but added into the bargain feedbacks from changes in sea ice and a detailed scheme that represented, region by region, how moisture built up in the soil, evaporated, or ran off in rivers to the sea. Their big problem was that from a standing start it took several centuries of simulated time for an ocean model to settle into a realistic state. After all, that was how long it would take the surface currents of the real ocean to establish themselves from a random starting-point. The atmosphere, however, readjusts itself in a matter of weeks. After about 50,000 time steps of ten minutes each, Manabe's model atmosphere would approach equilibrium. The team could not conceivably afford the computer time to pace the oceans through decades in ten-minute steps. Their costly Univac 1108, a supercomputer by the standards of the time, needed 45 minutes to compute the atmosphere through a single day. Bryan's ocean could use longer time steps, say a hundred minutes, but the simulated currents would not even begin to settle down until millions of these steps had passed. The key to their success was a neat trick for matching the different timescales. They ran their ocean model with its long time steps through twelve days. They ran the atmosphere model with its short time-steps through three hours. Then they coupled the atmosphere and ocean to exchange heat and moisture. Back to the ocean for another twelve days, and so forth. They left out seasons, using average annual sunlight to drive the system. Bryan wrote modestly at the time that "in one sense the... experiment is a failure." For even after a simulated century, the deep ocean circulation had not nearly reached equilibrium. It was not clear what the final climate solution would look like. (60) Yet it was a great success just to carry through a linked ocean-atmosphere computation that was at least starting to settle into equilibrium. The result looked like a real planet  not our Earth, for in place of geography there was only a radically simplified geometrical sketch, but in its way realistic. It was obviously only a first draft with many details wrong, yet there were ocean currents, trade winds, deserts, rain belts, and snow cover, all in roughly the right places. Unlike our actual Earth, so poorly observed, in the simulation one could see every detail of how air, water, and energy moved about. Following up, in 1975 Manabe and Bryan published results from the first coupled ocean-atmosphere GCM that had a roughly Earth-like geography. Looking at their crude map, one could make out continents like North America and Australia, although not smaller features like Japan or Italy. The supercomputer ran for fifty straight days, simulating movements of air and sea over nearly three centuries. "The climate that emerges," they wrote, "includes some of the basic features of the actual climate." For example, it showed the Sahara and the American Southwest as deserts, but plenty of rain in the Pacific Northwest and Brazil. Manabe and Bryan had not shaped their equations deliberately to bring forth such features. These were "emergent features," emerging spontaneously out of the computations. The computer’s output looked roughly like the actual climate only because the modelers had succeeded in roughly representing the actual operations of the atmosphere upon the Earth’s geography. Meanwhile the team headed by Warren Washington at NCAR in Colorado developed another ocean model, based on Bryan's, and coupled it to their own quite different GCM. Since they had begun with Bryan's ocean model it was not surprising that their results resembled Manabe and Bryan's, but it was still a gratifying confirmation. Again the patterns of air temperature, ocean salinity, and so forth came out roughly correct overall, albeit with noticeable deviations from the real planet, such as tropics that were too cold. As Washington's team admitted in 1980, the work "must be described as preliminary. "(63) Through the 1980s, these and other teams continued to refine coupled models, occasionally checking how they reacted to increased levels of CO2. These were not so much attempts to predict the real climate as experiments to work out methods for doing so. A few of the calculations showed a disturbing new feature  a possibility that the ocean circulation was fragile. Signs of rapid past changes in circulation had been showing up in ice cores and other evidence that had set oceanographers to speculating. In 1985, Bryan and a collaborator tried out a coupled atmosphere-ocean model with a CO2 level four times higher than at present. They found signs that the world-spanning "thermohaline" circulation, where differences in heat and salinity drove a vast overturning of sea water in the North Atlantic, could come to a halt. Three years later Manabe and another collaborator produced a simulation in which, even at present CO2 levels, the ocean-atmosphere system could settle down in one of two states  the present one, or a state without the overturning. (66*) Some experts worried that global warming might indeed shut down the circulation. They feared that halting the steady flow of warm water into the North Atlantic would bring devastating climate changes in Europe and perhaps beyond. Oceanographer Wallace Broecker remarked that the early GCMs had been designed to come to equilibrium, giving a stability that might be illusory. As scientists got better at modeling ocean-atmosphere interactions, they might find that the climate system was liable to switch rapidly from one state to another. On the other hand, since the cold oceans would take up heat for many decades before they reached an equilibrium, a climate that was computed for an atmosphere with doubled CO2 would not show what the planet would look like immediately after a doubling took place, but only what it would look like many decades later. Acknowledging these criticisms, Hansen's group and a few others undertook protracted computer runs to find what would actually happen while the CO2 level rose. Instead of separately computing "before" and "after" states, they computed the entire "transient response," plodding through a century or more simulating from one day to the next. Hansen's coupled ocean-atmosphere model, which incorporated the observed rise not only of CO2 but also other greenhouse gases, plus the historical record of aerosols from volcanic explosions, turned out a fair approximation to the observed global temperature trend of the previous half century. Pushed into the future, the model showed sustained global warming. By 1988 Hansen had enough confidence to issue a strong public pronouncement, warning of an imminent threat. The climate changes that different GCMs computed for doubled CO2, reviewers noted in 1987, "show many quantitative and even qualitative differences; thus we know that not all of these simulations can be correct, and perhaps all may be wrong. "(68) Skeptics pointed out that GCMs were unable to represent even the present climate successfully from first principles. Anything slightly unrealistic in the initial data or equations could be amplified a little at each step, and after thousands of steps the entire result usually veered off into something impossible. To get around this, the modelers had kept one eye over their shoulder at the real world. They adjusted various parameters (for example, the numbers describing cloud physics), "tuning" the models and running them again and again until the results looked like the real climate. This was possible because the real climate was increasingly well mapped by massive field studies. A variety of other criticisms were voiced. The most prominent came from Sherwood Idso. In 1986 he calculated that for the known increase of CO2 since the start of the century, models should predict something like 3°C of warming, which was far more than what had been observed. Idso insisted that something must be badly wrong with the models' sensitivity, that is, their response to changes in conditions. (77) Other scientists gave little heed to the claim. It was only an extension of a long and sometimes bitter controversy in which they had debated Idso's arguments and rejected them as too oversimplified to be meaningful. Even the actual cloudiness of various regions of the world had been measured in only a sketchy fashion. Until satellite measurements became available later in the 1980s, most models used data from the 1950s that only gave averages by zones of latitude, and only for the Northern Hemisphere. Modelers mirrored the set to represent clouds in the Southern Hemisphere, with the seasons reversed  although of course the distribution of land, sea, and ice is very different in the two halves of the planet. Many modelers felt a need to step back from the global calculations. Reliable progress would require more work on fundamental elements, to improve the sub-models that represented not only clouds but also snow, vegetation, and so forth. (81) Modelers settled into a long grind of piecemeal improvements. "There has been little change over the last 20 years or so in the approaches of the various modeling groups," an observer remarked in 1989. He thought this was partly due to a tendency "to fixate on specific aspects of the total problem," and partly to limited resources. "The modeling groups that are looking at the climate change process," he noted, "are relatively small in size compared to the large task. "(82) The limitations not only in resources but in computer power, global data, and plain scientific understanding kept the groups far from their goal of precisely reproducing all the features of climate. Yet under any circumstances it would be impossible to compute the current climate perfectly, given the amount of sheer randomness in weather systems. Modelers nevertheless felt they now had a basic grasp of the main forces and variations in the atmosphere. Their interest was shifting from representing the current climate ever more precisely to studies of long-term climate change. The effort was no longer dominated by American groups. At the Hadley Centre for Climate Prediction and Research in the United Kingdom and the Max Planck Institute for Meteorology in Germany, in particular, groups were starting to produce pathbreaking model runs. By the mid 1990s, some modelers in the United States feared they were falling behind. One reason was that the U.S. government forbade them from buying foreign supercomputers, a technology where Japan had seized the lead. National rivalries are normal where groups compete to be first with the best results, but competition did not obstruct the collaborative flow of ideas. An important example of massive collaboration was a 1989 study involving groups in the United States, Canada, England, France, Germany, China, and Japan. Taking 14 models of varying complexity, the groups fed each the same external forces (using a change in sea surface temperature as a surrogate for climate change), and compared the results. The simulated climates agreed well for clear skies. But "when cloud feedback was included, compatibility vanished." The models varied by as much as a factor of three in their sensitivity to the external forces, disagreeing in particular on how far a given increase of CO2 would raise the temperature. (85) A few respected meteorologists concluded that the modelers' representation of clouds was altogether useless. No less important, the sketchy parameterizations in the models were increasingly refined by field studies. Decade by decade the science community mounted ever larger fleets of ships, aircraft, balloons, drifting buoys and satellites in massive experiments to observe the actual processes in clouds, ocean circulation, and other key features of the climate system. (See the separate essay on International Cooperation.) Processing and regularizing the measurements from such an exercise was in itself a major task for computer centers: it was little use having gigabytes of observational data unless that could be properly compared with the gigabytes of numbers produced by a computer model. Incorporating aerosols into GCMs improved the agreement with observations, helping to answer a major criticism. Typical GCMs had a climate sensitivity that predicted about 3°C warming for a doubling of CO2. However, as Idso and others pointed out, the actual rise in temperature over the century had not kept pace with the rise of the gas. Try as they might, the modelers had not been able to tune their models to get the modest temperature rise that was observed. An answer came from models that put in the increase of aerosols from humanity's rising pollution. The aerosols' cooling effect, it became clear, had tended to offset the greenhouse warming. This reversed the significance of the models' earlier inability to reproduce the temperature trend. Apparently the models that had been tuned without aerosols had correctly represented a planet without aerosols; they had been grounded solidly enough in reality to resist attempts to force them to give a false answer. Still, scientists are always happier if they can reproduce an answer using independent methods. This had always been a problem with climate models, with their tendency to interbreed computer code and to rely on similar data sets. One solution to the problem was to cut down to the central question — how much would temperature change if you changed the CO2 level? — and look for a completely different way to get an answer. The answer could be boiled down to a simple number, the climate's "equilibrium sensitivity," which by now was conventionally taken to mean the temperature change for a doubling of CO2 after the system had settled into a new equilibrium. Unfortunately, many confused this with the "sensitivity" described by the Charney panel — the temperature change within the first century or so after a CO2 doubling, not taking into account the long-term changes in ice sheets, vegetation, and so forth that would play out over centuries before a new equilibrium was reached. After all, the computer models available to the panel in 1979 had been too primitive to run ahead more than a century or two. Worse, this "Charney sensitivity" as some called it (although others used the term as a synonym for "equilibrium sensitivity") could itself be misleading. With greenhouse gas levels soaring faster than anyone had expected, the "transient" response — the amount of warming felt on the day CO2 reached twice the pre-industrial level — would be well below the warming in following decades, let alone centuries. Confidence rose further in the late 1990s when the modelers' failure to match the CLIMAP data on ice-age temperatures was resolved. An early sign of where the trouble lay came from a group that laboriously sifted coral-reef samples and announced in 1994 that the tropical sea-surface temperatures had been much cooler than CLIMAP had claimed. They noted that their finding "bears directly on modeling future climate." But one finding in isolation could not shake the CLIMAP consensus. The breakthrough came when a team under Lonnie Thompson of the Polar Research Center at Ohio State University struggled onto a high-altitude glacier in the tropical Andes. The team managed to drill out a core that recorded atmospheric conditions back into the last ice age. The results, they announced, "challenge the current view of tropical climate history..." It was not the computer models that had been unreliable, but the oceanographers' complex manipulation of their data as they sought numbers for tropical sea-surface temperatures. Another positive note was the plausible representation of middle-scale phenomena such as the El Niño-Southern Oscillation (ENSO). This irregular cycle of wind patterns and water movement in the tropical Pacific Ocean became a target for modelers once it was found to affect weather powerfully around the globe. Such mid-sized models, constructed by groups nearly independent of the GCM researchers, offered an opportunity to work out and test solutions to tricky problems like the interaction between winds and waves. By the late 1990s, specially designed regional models showed some success in reproducing the structure of El Niños (although predicting them remained as uncertain as predicting any specific weather pattern months in advance). As global ocean-atmosphere models improved, they began to spontaneously generate their own El Niño-like cycles. Yet the models were far from proven beyond question. The most noticeable defect was that when it came to representing the present climate, models that coupled atmosphere to oceans were notably inferior to plain atmosphere-only GCMs. That was no wonder, since arbitrary assumptions remained. For example, oceanographers had not solved the mystery of how heat is transported up or down from layer to layer of sea water. The modelers relied on primitive average parameterizations, which new observations cast into doubt. Yet if modelers now understood how the climate system could change and even how it had changed, they were far from saying precisely how it would change in future. Never mind the average global warming; citizens and policy-makers wanted to know what heat waves, droughts or floods were likely in their particular region. One response was to concentrate your computer power on a fine-grained grid covering only the region of interest, embedded in a cruder global model. Some teams began to develop such regional models in the 1990s, and in the early 2000s they began to proliferate around the world in forms useful to national policy-makers. (101a) Other teams continued to place their chips on fully global models. Either approach would need a much more realistic ocean and clouds. The attention of the community turned to making ever more detailed predictions. Looking farther afield, the future climate system could not be determined very accurately until ocean-atmosphere GCMs were linked interactively with models for changes in vegetation. Dark forests and bright deserts not only responded to climate, but influenced it. Since the early 1990s the more advanced numerical models, for weather prediction as well as climate, had incorporated descriptions of such things as the way plants took up water through their roots and evaporated it into the atmosphere. Models for climate change also had to figure in competition between plant species as the temperature rose. As usual, comparison with global data posed a problem: while the models disagreed with one another in simulating what type of vegetation should dominate in certain regions, surveys of the actual planet disagreed with one another just as much. (102) Changes in the chemistry of the atmosphere also had to be incorporated, for these influenced cloud formation and more. All these complex interactions were tough to model. Over longer time scales, modelers would also need to consider changes in ocean chemistry, ice sheets, entire ecosystems, and so forth. When people talked now of a "GCM" they no longer meant a "General Circulation Model," built from the traditional equations for weather. "GCM" now stood for "Global Climate Model" or even "Global Coupled Model," incorporating many things besides the circulation of the atmosphere. Increasingly, people talked about building "Earth System Models," in which air, water and ice were tied to many features of chemistry, biology and ecosystems — sometimes including that outstanding ecological factor, human activity (for example in agriculture). Such simulations strained the resources of the newest and biggest supercomputers, some of which were built with climate modeling primarily in mind. Where early models had used a few thousand lines of code, an advanced simulation of the 2000s might incorporate more than a million lines. The Earth System Models were a triumph of a long trend in many sciences toward holistic thinking, treating the planet as a physical and biological whole. And the international modeling community itself manifested a parallel trend toward the globalization of social institutions. The IPCC was just one of a proliferation of new international bodies tying together the 21st-century world. It was also disturbing that model calculations did not match observations of the temperature structure of the atmosphere. In 1990 Roy Spencer and John R. Christy of the University of Alabama, Huntsville had published a paper that eventually resulted in hundreds of publications by many groups. Although warming might be observed at the Earth's surface, they pointed out that satellite measurements showed essentially no warming in recent decades at middle levels of the atmosphere — the upper troposphere. More direct measurements by balloons and radiosondes (rockets) likewise showed no warming there. However, a greenhouse-warming "tropospheric hot spot," especially in the tropics, had been predicted by all models clear back to the 1975 work of Manabe and Wetherald. (104a) Indeed not only greenhouse warming, but anything that produced surface warming in the tropics should also warm the atmosphere above it, through convection. People who insisted that global warming was a myth seized on this discrepancy. They said it proved that people should disbelieve the computer models and indeed all expert opinion on global warming. But was it the models that were wrong, or the data? For a climate pretty much like the present, however, all the significant mechanisms must have gotten incorporated somehow into the parameters. For the models did produce reasonable weather patterns for such different conditions as summer and winter, the effects of volcanic eruptions and so forth. At worst, the models were somehow all getting right results for wrong reasons — flaws that would only show up after greenhouse gases pushed the climate beyond any conditions that the models were designed to reproduce. If there were such deep-set flaws, that did not mean, as some critics implied, that there was no need to worry about global warming. If the models were faulty, the future climate changes could be worse than they predicted, not better. The modelers had reached a point where they could confidently declare what was reasonably likely to happen. They did not claim they would ever be able to say what would certainly happen. Different model runs continued to offer a range of possible future temperatures, from mildly bad to disastrous. Worse, the various GCMs stubbornly continued to give a wide range of predictions for particular regions. Some things looked quite certain, like higher temperatures in the Arctic (hardly a prediction now, for such warming was becoming blatantly visible in the weather data). Most models projected crippling heat and dryness in the American Southwest and Southern Europe. But for many of the Earth's populated places, the models could not reliably tell the local governments whether to brace themselves for more droughts, more floods, or neither or both. By the dawn of the 21st century, climate models had become a crucial source of information for policy-makers and the public. Where once the modelers had expected only to give talks at small meetings of their peers followed by formal publication in obscure scientific journals, their attention now focussed on working up results to be incorporated in the reports that the IPCC issued to the world's governments. Struggling to provide a better picture of the coming climate changes, the community of modelers grew larger and better organized. It was obviously necessary to compare the models devised by different groups, and a Coupled Model Intercomparison Project (CMIP), became a central ongoing activity. For example, the fifth iteration, CMIP5, was completed in 2014 in time to guide the IPCC's 5th report; by that time planning for CMIP6 was underway, and by 2018 it embraced 33 modeling groups in 16 countries. This cooperative framework forced the groups to agree on schemes for representing features of climate and formats for reporting their data. Each computer modeling group normally worked in a cycle. When their model began to look outdated, and still more if they managed to acquire a new supercomputer, they would go back to basics and spend a few years developing a new model. It was no simple task. The laborious tuning of parameters to produce a realistic final climate meant that a small error in the way the old model had calculated a process might have been compensated by small errors in other processes. Introducing a minor new wrinkle (for example, a better way to calculate convection in the tropics) often introduced unexpected feedback that made the entire model crash. Once a team had persuaded their model to produce stable results that looked like the real world, they would spend the next year or two using it to analyze climate processes, gathering ideas for the next cycle. The IPCC pressed the teams to work out a consensus on a specific range of possibilities to be published in the 2007 report. The work was grueling. After a group had invested so much of their time, energy, and careers in their model, they could become reluctant to admit its shortcomings to outsiders and perhaps even to themselves. A frequent result was "prolonged and acrimonious fights in which model developers defended their models and engaged in serious conflicts with colleagues" over whose approach was best. (111) Yet in the end they found common ground, working out a few numbers that all agreed were plausible. 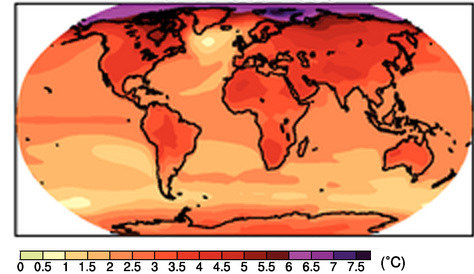 Projected temperatures for 2080-2099 (rise above the 1980-1999 level, mean of mulitiple GCMs) for the "A2" scenario, in which the world begins now to restrict its greenhouse gas emissions. For the IPCC's fifth report, issued in 2013, computer modeling teams launched an even more massive cooperative multi-year effort. The results were scarcely different from earlier attempts. "The drive to complexity has not reduced key uncertainties," two of the experts reported. "Rather than reducing biases stemming from an inadequate representation of basic processes, additional complexity has multiplied the ways in which these biases introduce uncertainties in climate simulations." The panel concluded that equilibrium sensitivity for doubled CO2 was "likely" to be in the range 1.5 to 4.5°C — exactly the same as the conclusion reached by the Charney panel 34 years earlier, albeit with much higher confidence and on a much sounder basis of evidence. Many people thought this meant global temperature would be up by three degrees, give or take, on the day CO2 reached twice the pre-industrial level. In fact the Charney panel had warned that it would take decades more to see the full effects. Indeed complete equilibrium would only be reached after centuries of melting ice fields and changes in forest cover and ocean circulation and so forth, which even the newest models scarcely understood. An international group of scientists warned that there were so many uncertain processes that the long-term global warming might be twice what the models projected. Another illustration of the models' shortcomings came from a widely noted paper by Ivy Tan, a graduate student at Yale. Looking at the fraction of ice crystals in one common type of cloud, using data accumulated by a satellite launched ten years earlier, she found that the clouds held less ice than modelers supposed. Colleagues plugged the correction into one leading climate model, and saw the equilibrium sensitivity jump up by one degree. When other experts were asked for their opinion they could only shrug — yes, all the models would need more work before they could provide solid long-term projections. The behavior of clouds, and the effects of aerosols in particular, remained the chief source of uncertainty. Hundreds of experts devoted their careers to making marginal improvements. For example, in 2017 the authors of the widely used Community Earth System Model worked up a more elaborate version, and found it over-estimated the cooling effects of the sulfate pollution that had spread in the mid 20th century. Development was held up for half a year during exhaustive discussions between specialists in cloud-aerosol parameters and specialists in emissions data. In the end both sides had to make revisions. This was just one of many examples of grueling cooperative work by multiple teams, adjusting parameters to get a better reproduction of actual weather patterns. In the early 2000s some modelers took up a new question: could you blame recent climate disasters on global warming? While diferent models differed in details of their predictions, they got broadly similar results when they compared two extreme cases: a world where humans had never emitted any greenhouse gases, and our actual 21st-century world. They found that many of the worst recent floods, heat waves, and droughts would have been less severe in the no-emissions world. For example, a 2017 study resolved uncertainties in the long-standing prediction that land in middle latitudes would get drier. The drying was already observable and was "mainly attributable to anthropogenic climate change. "(117) A wave of such "attribution" studies showed that human emissions not only would bring, but were already bringing, harm to agriculture, health, and natural ecosystems. Attribution of specific impacts became the new frontier of computer work. For all the millions of hours the modelers had devoted to their computations, in the end they could not say exactly how serious global climate change would be. But they could say with confidence that it was already doing serious harm, that the harm would certainly get worse, and that unless strenuous measures were taken without delay there was a high risk of appalling catastrophe. What do the current models predict global warming will mean for humanity in practical terms? See the summary of expected Impacts of Climate Change. 113. On 21st-century sensitivity work see Zeke Hausfather, "Explainer: How Scientists Estimate 'Climate Sensitivity'," Carbonbrief.org (June 19, 2018), online here. Paleoclimate sensitivity: Hegerl et al. (2006) and an even lower upper limit according to Annan and Hargreaves (2006), see also Kerr (2006). A more recent landmark study by a multitude of groups, PALAEOSENS (2012), again converged on a range of 2-5°C. Earlier literature is reviewed in Royer et al. (2001); some key studies were Berner (1991) (chemical and other measures of high Cretaceous CO2) and McElwain and Chaloner (1995) (using characteristics of fossil leaves). Another, rougher, way to measure sensitivity, using the amount of cooling after major recent volcanic eruptions, again gave results within this range: Wigley et al. (2005). IPCC (2007b) p. 13 gives a set of "likely" ranges depending on emission scenarios, with the lowest "likely" (5% probability) global mean temperature 1.1°C and the highest 6.4°C. These are for the decade 2090-2099, but the decade that would see doubled CO2 depends on the economic scenario.